This is a monitor desk stand that installs via a bolt-on base. This stand allows to save space on your desktop and to aim the monitor in any position around the pole The VESA bracket is height adjustable. Extra items can be added to the pole, as shown below in Options. 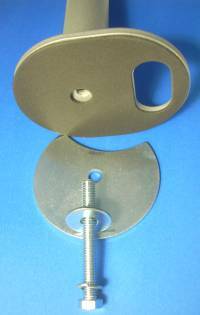 - Pole Height: 17 3/4"
- Grommet install suitable for tabletops up to 2" thick . Also can be screwed onto a surface. - "Through" Bolt: Diam. : 8 mm (0.315"; approx. 5/16"); Length: 7.5"
- LCD Bracket plate is compatible with VESA 75 & 100 mm standard hole patterns. - The monitor's height is easily adjustable w/o requiring tools, via its handle. - LCD bracket tilt: 90 degrees down w/o monitor; 110 up w/o monitor. Actual tilt is only limited by the size of the screen. - Includes cable clips; Cable can be run through the table. - Ideal monitor weight: up to 23 lbs. - Easy Torque adjustability for all articulations.